Many dog behaviour problems are easily rectified by following some basic dog training tips. Others may require specialist help, and lots and lots of patience from the dog owner. This section offers various tips and advice about how to address some of the most common dog behaviour problems. 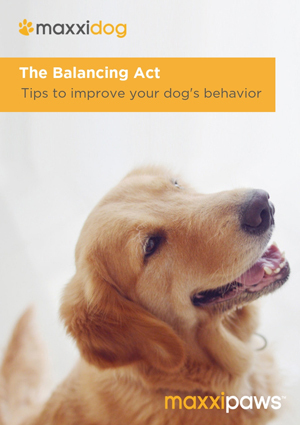 There is no one way to raise a balanced dog, but there are some basic principles that will increase your chances of getting it right. The more you know in advance about dogs' behaviour and dog training the better. Some things that affect dog's behaviour you have no control over. Some dog breeds are by nature calmer than others are. The parents' temperament also plays a role, so do the breeders as the first weeks in your puppy's life are of great importance. If you adopt older dog, then all his previous experiences will affect his behaviour. Many dog behaviour problems are indeed the owners' problem. The problem may be lack of socialization when the dog was a puppy. It may because the owner is not consistent with his commands, or the dog has not had basic dog training. What's more, our behaviour can reflect on our dogs. If we are nervous or scared of something, then our dog may become scared of it as well. There are few, if any, dog owners that would not do something differently if starting again. However, that is not what matters most now. What matters most is to address any behavioural problems as soon as they arise. To seek advice, but more importantly, to take the time to work with the dog to resolve the problem. The best way to deal with any dog behaviour problem is to address the cause of the problem and dog behaviour correction techniques helps you to do exactly that. Systematic desensitization and counter-conditioning are the most common treatments for canine anxiety, phobias, fear, and aggression, i.e. any behavioural problem that involves arousal or emotional reaction. Using dog behaviour training techniques requires full commitment from the dog owner. They work by repetition so it takes time and patience… lot of patience. But they address the root of the problem so it is usually time well spent. Potential side effects from dog anxiety medication include sedation, lethargy, change in appetite, weight changes, runny nose, dry mouth, drowsiness, weakness, sore throat, nausea, and diarrhea. Behavioural side effects can include aggression, anxiety, panic attacks, trouble sleeping, paradoxic excitement, irritability, agitation, hostility, restlessness, hyperactivity, or increased depression… ironically some of the problems you are trying to overcome. Like dog anxiety medication, calming aid for dogs does not cure any dog behaviour problems. They can however help your dog to cope better with situations he finds stressful. They can also help you to get quicker results with your dog behaviour correction training. For maximum results, you should give your dog his calming aid for few weeks prior to the "big event", whatever it is firework display, flying, moving houses, or attending a dog behaviour modification training course. maxxicalm comes with a FREE eBook containing practical dog behaviour advice. Following them will increase your chances of getting the situation permanently under control. The most effective way to deal with any dog behavioural problem is to use dog behaviour correction techniques. Desensitization and counter-conditioning are the most common treatments for canine anxiety, phobias, fear, and aggression, i.e. any behavioural problem that involves arousal or emotional reaction. The eBook recommends changes that can be helpful to deal with various situations, e.g. fear of new things, noise phobia, fear of fireworks and thunderstorms, anxiety when visiting the Vet or groomers, moving houses, going to the dog sitters, fear of travelling (by car or flying), separation anxiety, aggression, and hyper dog behaviour. Most of the changes recommended can easily be adjusted to fit other situations that your dog may find stressful.